Plumbing Coupons in Lakewood, Just For You! Big Jerry's Plumbing is an affordable company with fair prices, but we'd love to give a little something extra, especially if you've never used us before. Below are drain cleaning and plumbing coupons our Lakewood friends should appreciate. Please check back for new offers! OR, you may present these coupons directly from your mobile device---show it to our tech when they arrive! Big Jerry's Plumbing knows everybody likes to get a great deal. We always aim to provide quality and affordability, and that alone can be a great deal. But we still wanted give a plumbing special or some plumbing coupons Lakewood WA area folks can use or share with friends. Check back with us for other new special offers for plumbing and drain cleaning. Make sure to click the coupon and then allow your computer to download the coupon image. You can then open the file and print it! Or you can present the coupon straight from your smartphone or your mobile device---no download needed. Just show us the plumbing coupon. 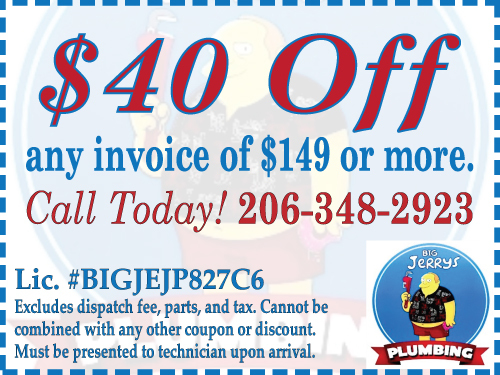 We love to give new customers the opportunity to try Big Jerry's Plumbing at a small discount, or to reward returning customers for checking back to this page for these Lakewood Plumbing Coupons! Drain Cleaning Lakewood can Count on for large or small clogs. Not all Lakewood plumbers handle all sewer line issues like we do.